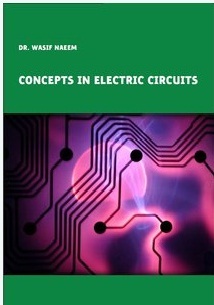 This is an amazing book on basic concepts of electric circuits. Itcovers fundamental aspects of electric circuits that form the core of many engineering disciplines. In particular, basic circuit elements and their characteristics are presented when connected in an electric network. In addition, techniques to analyse and solve electric circuits are explained in a simple manner and examples are shown to demonstrate each strategy. DC as well as AC circuit analysis is provided with a brief account of filters in the end. Difficult electric circuit concepts such as sinusoids and phasors are explicated in an effective way so that basic understanding can be properly achieved.covers fundamental aspects of electric circuits that form the core of many engineering disciplines. DC as well as AC circuit analysis is provided with a brief account of filters in the end. Difficult electric circuit concepts such as sinusoids and phasors are explicated in an effective way so that basic understanding can be properly achieved.